Thailand is one of my favourite places in the world! It’s a country enriched in culture , the places and the people are just wonderful. My first trip to Thailand was back in 2016 and I had the best time of my life, so I knew I was due a trip back. We arrived in Bangkok airport and admittedly spending 3 hours in line for security (which was incredibly frustrating) wasn’t the best start, I was raring to go. We stayed in a hostel just off from the infamous Khao San Road. An ideal landmark for travelling around, and a private room for 2 costing a bargain price or £4 a night. The room was very basic but what else do you need? I absolutely love Khao San Road. It’s a fab spot during the day for shopping around the market stalls and generally chilling around the cheap bars and restaurants. Then at night the road comes alive with backpackers ready to party, plenty of buckets and often enough the random street party. It’s such a great place to just let go and enjoy yourself, I always leave this place with an amazing feeling. The following day we had a ride around on the Tuk Tuks eventually arriving at the Grand Palace. We didn’t bother going in as I have been before and it was getting late, but I would recommend visiting if you’re interested in Thai culture and history. After that we headed to the MBK centre for a spot of shopping. This was an incredible shopping centre with everything you could possibly think of from small local sellers to NYX stores. Unfortunately we hadn’t planned to stay in Bangkok too long. I love the city but you definitely do not want to spend more than a couple of days here as it’s very busy and humid, but also there are so many more incredible places in Thailand to visit. After grabbing our rucksacks from the hostel and jumping on a Tuk Tuk to the bus station (probably not the smartest of ideas with 2 huge rucksacks and driving on the motorways) we arrived ready to hop on a 13 hour bus to Phucket. Now we had originally decided to opt for the bus as the flights were quite pricey at the time of booking, however the overnight bus is very longgggggggg. I basically spent the journey watching 13 reasons why, eating everything I could possibly buy from 7/11 and counting down the hours until we arrived. What we learnt here: book your flights early so you don’t have to get the overnight bus. Finally though we made it to Phucket! I was so ready to get to the hostel and climb in the pool. We stayed at the Lub d hostel in Patong. This was such a fab hostel! While a little pricey than others in the area, it has some fab facilities including an amazing swimming pool, a Thai boxing ring, hammocks, and arcade games, and the most amazing breakfasts! I would definitely recommend this place, very modern and offers both dorm and private rooms. Now one thing I didn’t think about is that the islands are so much hotter than mainland Thailand. So after arriving in Phucket after 13 hours travelling, tired and desperate to lounge by the pool, getting suncream out of the bottom on my rucksack never occurred to me. How stupid I was. The sun burn was ridiculous! We both suffered bad burns and sun stroke for days! Always apply suncream kids. Nevertheless we tried to power through to go and explore the area. We wandered to the beach for food and cocktails. Patong beach is very much a tourist hotspot, but still a great place to relax. The next day we awoke quite early for our excursion to the elephant sanctuary that we had booked at a travel agents near the beach the day before. The sanctuary picked us up from our hotel and drove us up the island to where the elephants live. 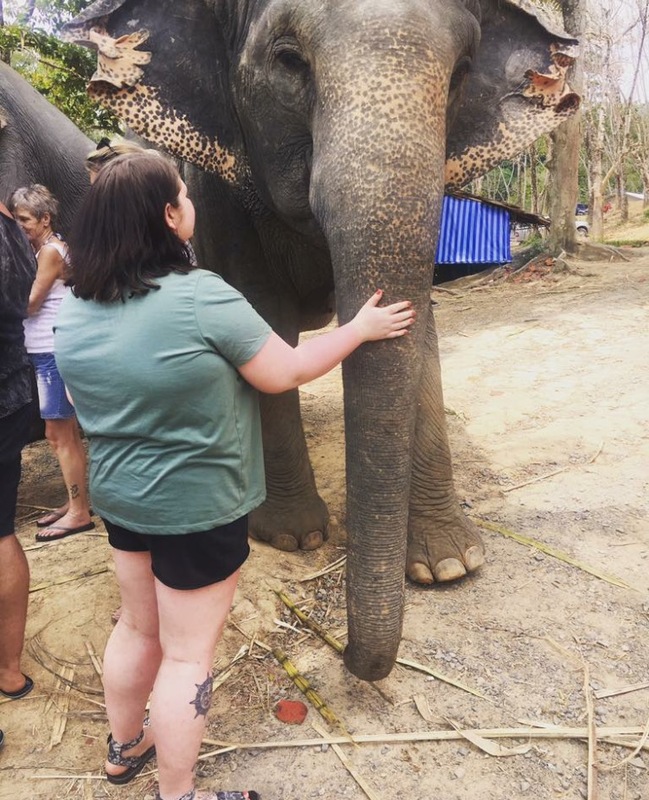 Having been to an elephant sanctuary my first time in Thailand, I was desperate to go and see them again! They’re incredible creatures. We arrived at the sanctuary and after a quick talk about the elephants that they look after they took us see the elephants. The sanctuary supplied buckets of fruit for us to feed them. I even got a kiss of the baby elephant which was so cute! After feeding time we went to put our swimsuits on and took to the mud pool to bathe the elephants in mud. This was such a magical time to spend with the elephants, you can tell that they really enjoy it! One of the Thai ladies was even putting mud on my back to cover the sunburn. After a bathe in the mud we took the elephants for a dip in a water pool. Swimming with elephants?! It was incredible, a memory that I will never forget. After returning to the hostel after the elephant sanctuary we decided to spend some time relaxing by the pool before heading out to grab some food. Because of our sun stroke we weren’t really up to partying, instead we just explored the area a little and discovered an amazing Thai restaurant near the beach. This first part of your trip looks like a fantastic experience! Elephant sanctuaries seem like such beautiful places. 😍 I’m sorry you both got those sunburns though! So annoying to deal with, especially on vacation.